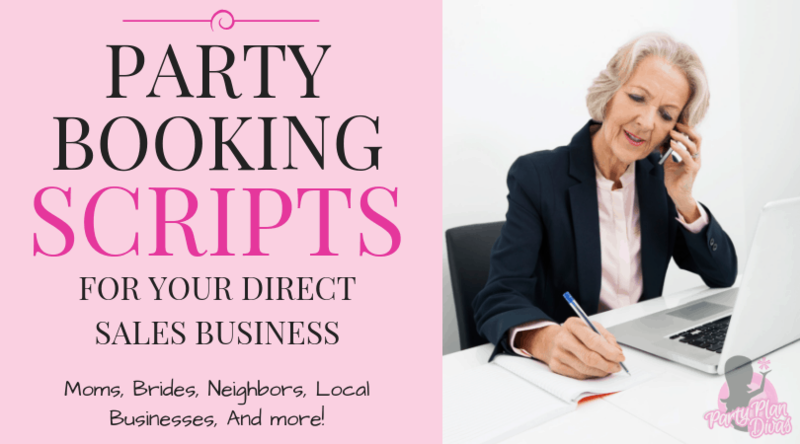 Check out these simple party booking scrips for your direct sales business to confidently fill your calendar! When you have a plan for what to say, it is much easier to pick up that “600 pound phone” and make every call you make a success! 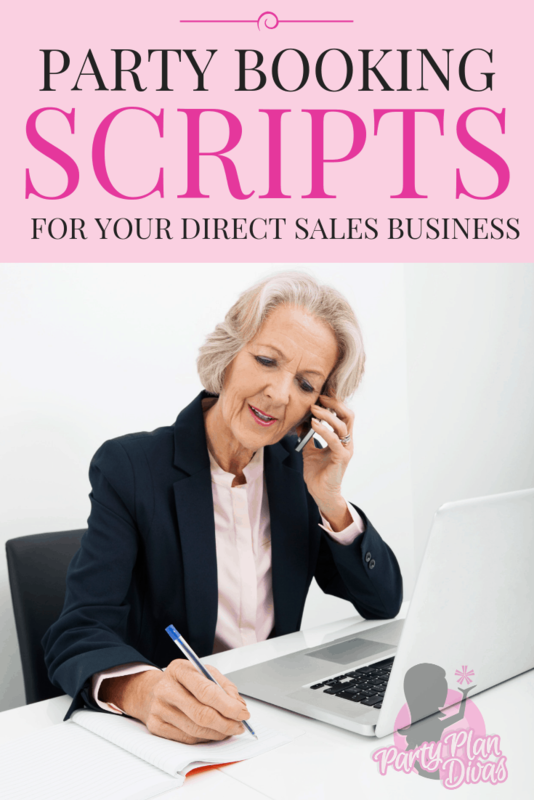 Scripts for Brides, Moms, Neighbors, Businesses, and more! Hi _____, this is Suzie. I’m just calling to make sure I’m giving you good service. I’ll just take a minute of your time. How are you set with your _ (items ordered) ___________ and ____________? Did you like the _____ sample that I put in your last order? Is there anything you’d like to try for the first time? I’m having a special on _____ right now. (Describe briefly). Would you be interested in checking it out? Thank you. I appreciate your loyalty. Who do you know who might also be interested in try it too? Excellent, thank you so much. I will give her a call. One last thing, we have just released some new products I think you and your friends would love. Since you have always been so kind, I would love to give you first dibs on the dates I have available to show your friends these great products while earning some freebies for you too! Would a weeknight or weekend be better for you? Excellent, thank you so much. I will get a hostess packet in the mail to you in the morning. Be sure to put my brochure by your phone or on the refrigerator. I’ll be calling you about every other month, but if you want or need anything in the meantime, just give me a call. Have a great day! Congratulations on your recent wedding and I wish you much happiness! You have been selected as one of the new brides in the area to receive a free party. As a Hostess, You will receive… How does that sound? All we need to do is pick a date and I will get a hostess packet in the mail to you right away. Does a weeknight or weekend work better for you? Congratulations on the birth of your daughter/son. I know that you are now at a point where you would love to be pampered! You have been selected to receive a FREE __________ and Party! As a Hostess, you will also receive…. Doesn’t that sound relaxing? All we need to do is pick a date and I will get a hostess packet on its way to you. Which do you think would be better – a weeknight or weekend? Hi, I’m your neighbor and would love the opportunity to meet you and share my business with you with a fun Girls Night In For you and your friends. As a Hostess, you will receive… doens’t that sound fun? All we need to do is pick a date and I will get a hostess packet on its way to you. Which do you think would be better – a week night or weekend? This is ____________________, a _________ Consultant. I am calling to welcome you to ___________. I want you to know how happy we are to have you in the community. I offer a free ________ to all newcomers in the area. When is a good time that we could get together? Hi, this is ___________________, a _________ Consultant. I would like to offer you one of the services that ______ provides absolutely free for businesses in the area. Our _______ Consultants are available to teach ________ classes for your employees. We have found that when employees are pampered with our products, it improves their attitudes and increases your business productivity. I’m sure you’re interested in that, aren’t you? Hello, ____________. I’m a ________ Consultant. 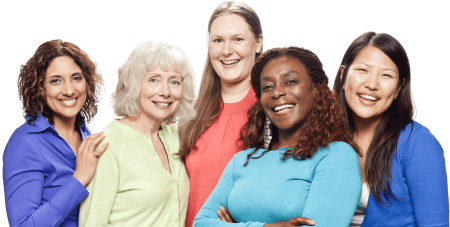 We provide complimentary parties to women’s clubs and organizations in this area. We have found that women like to get together and shop in the surroundings of their girlfriends. Would you be interested in setting up a date with me?